Info: A Tibetan mother of two, Chagmo Kyi, self-immolated on November 17 at around 4 pm and died in Dolma Square, Rebkong (Chinese: Tongren), Qinghai. Local lay Tibetans and monks gathered to mark Chagmo Kyi's death despite an intense military buildup in the area following peaceful protests and other self-immolations over the past week. According to Tibetan sources hundreds of Tibetans attended her cremation, at a site normally used for the cremation of monks and lamas. They were surrounded by troops. 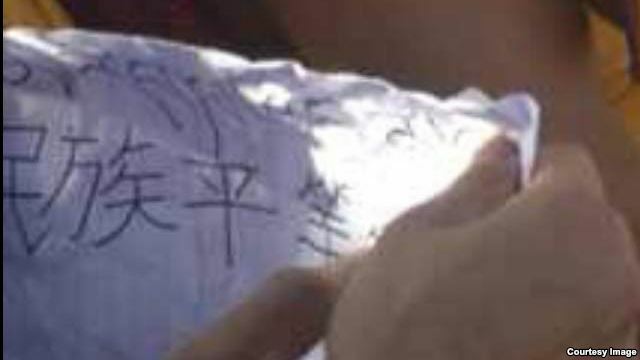 In Rebkong, 26 years old Chagmo Kyi, had left letters written in Chinese and in Tibetan before her self-immolation at the Dolma grounds on Saturday. In her letters, Chagmo Kyi expressed her wish for equality of all nationalities and called on the new Chinese leader Xi Jinping to meet with the Dalai Lama. She had written the word peace on the letter sheet. Chagmo Kyi, a native of Rebkong Meypa Khagya village in eastern Tibet, self-immolated at the Dolma Square in front of Rongwo Monastery in Rebkong at around 4 pm (local time). She is believed to have been around 27 years of age and has two children. 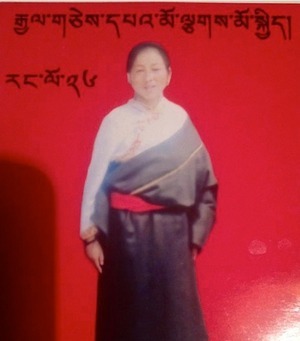 According to the Dharamshala based rights group, Tibetan Centre for Human Rights and Democracy, Chagmo Kyi passed away at the site of her protest. Her body was later taken to the Rongwo Monastery where thousands of Tibetans reportedly gathered to offer prayers. Various sources have told Phayul that a large number of Chinese armed forces have been deployed in the region, further increasing tensions. Severe restrictions on the movement of local Tibetans in Rebkong region, which alone has seen eight self-immolation protests in November, have been placed.